Mr. Frederick Pang is semi-retired. He is a volunteer Director on the Board of the Pentagon Federal Credit Union (PFCU), a Volunteer Direction on the Board of the PFCU Foundation, and a senior advisor to a number of companies in the private sector. Until October 2005, he was the President and founder of ViStar Corporation. ViStar provided professional services to the Federal Government. Among others, the company provided support to the then Coalition Provisional Authority, the Office of Assistant Secretary of Defense for Homeland Defense, the Office of J-1 on the Joint Staff, the Office of the Deputy Chief of Staff of the Army for Operations, and the Human Resources Office of the State Department. He sold the company in 2005, and served in a transitional leadership role until 2007. Prior to founding ViStar, Mr. Pang served as the Assistant Secretary of Defense for Force Management Policy. As Assistant Secretary he had Defense-wide responsibility for military and civilian manpower and personnel policies and programs, including the recruitment, training, career development, compensation, retention, quality of life, equal opportunity, and readiness of Defense personnel. Mr. Pang also served in a dual capacity as the Principal Deputy Under Secretary of Defense for Personnel and Readiness. Previously, Mr. Pang served as the Assistant Secretary of the Navy for Manpower and Reserve Affairs. In this capacity, he had Departmental oversight responsibility for military and civilian personnel, reserve forces, health affairs, and related readiness policies and programs in support of the Navy and Marine Corps. Before his appointments in the Executive Branch, Mr. Pang served as a professional staff member on the Senate Armed Services Committee. In this key role, he exercised policy and legislative oversight on Defense-wide personnel, reserve, and medical programs. Prior to joining the Senate Armed Services Committee, Mr. Pang served as a regular officer in the United States Air Force for 27 years. During his Air Force career, he served in a variety of operational and staff assignments including tours of duty in Vietnam, Headquarters United States Air Force, and the Office of the Secretary of Defense. He retired in the grade of colonel in 1986. His military and civilian awards include the Bronze Star medal; the Defense Meritorious Service Medal (awarded twice); the Defense Superior Service Medal; the Defense Outstanding Public Service Medal; the Navy Distinguished Public Service Medal; the Selective Service Distinguished Public Service Medal and the Defense Distinguished Public Service Medal. Mr. Pang grew up in Honolulu, Hawaii. 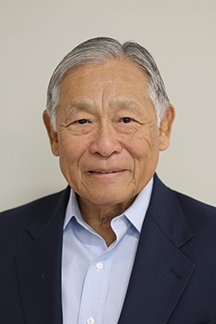 Mr. Pang graduated from McKinley High School in 1954, and graduated from the University of Hawaii in 1958 with a Bachelors Degree in Education. He earned a Masters Degree in Business Administration in 1972 from the University of Hawaii under the Air Force Institute of Technology Civilian Institutions Scholarship Program.